Ben and Sara Munday wanted to build a modern home in the San Francisco Bay Area where they could let the outside in and make the most of their view. After researching options for regular construction, the price was cost prohibitive and the timeline was too slow for their needs. When Sara read an article about pre-fabricated homes, they were intrigued at the possibilities Connect Homes could provide with a fixed price, a six month timeline from start to finish and the modern style they craved. This solution allowed the Mundays to create a perfect, modern indoor-outdoor lifestyle home that fell within their budget. They selected Connect Model 8: a 3 bedroom, 2.5 bath 2,560 square foot house constructed from 8 modules. Each module was the same size as a shipping container, so having the pre-fabricated structure transported from the factory in Los Angeles and shipped to the Bay Area was easy. Open floor plans are a quintessential feature of modern living. The lower level of the Connect Model 8 is no exception. It boasts an open dining room, living space and kitchen area that feels like one. To aid in this modern feel, Milgard Bronze Anodized Aluminum windows and patio doors were used throughout. The frames are thin with clean lines, directing your eye to the view. The large walls of windows let in a lot of light and help them feel at one with their surroundings. "We were able to choose the position of the doors and windows to make the most of the sunlight and view" said Ben. 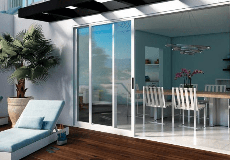 "And, we even added extra sliding doors to the design. One of the reasons we chose this location was to be able to be outside." Their new home is clean and modern, with a luxurious feeling, but also practical to accommodate their family life with two young children. They can easily commune with nature from their hillside home, enjoying fresh air, treetop vistas and spotting local wildlife through the windows from any spot in the house. Milgard Dealer: Arcadia Sash & Door Inc.